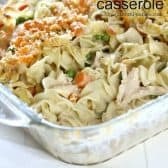 A comforting recipe with noodles, chicken and veggies in an easy and creamy sauce. Add 2 tablespoons butter to a large saucepan. Cook onion, celery & carrot until softened, about 5 minutes. Stir in flour, thyme, pepper and poultry seasoning and cook an additional 2 minutes. Add milk and broth. Cook over medium heat until bubbly. Remove from heat and stir in cream cheese & cheddar cheese until melted and smooth. Cook noodles 1 minute less than directed on the package. Drain. Combine chicken, noodles, red pepper, peas, and sauce. Pour into a greased 9×13 pan. Combine topping ingredients and sprinkle over noodles. Bake 30-35 minutes or until heated through.